The past decades have seen an influx of other cuisines into British life and no matter whether you are a die-hard Brit who loves some pie and mash or a seasoned traveller, it's hard to deny these cuisines offer something special. It may surprise you that Catford could be your new go-to when you fancy a 'world trip' of sorts. Without the stressful airport parking and hotel transfers. Be prepared to enjoy the flavours of the Mediterranean, Italian delicacies and dishes of the Americas and the flavours of the Far East. Or maybe you still aren't convinced and just want a sandwich and a coffee. Well that's fine too. Catford has something to offer for all tastes. A homely and inviting café, bar and grill based right in the heart of Catford. Deli Nene serves Mediterranean style food such as tapas, wraps and burgers. In fact, the menu is so extensive we dare you to find someone they don’t cater for. They are also family-friendly, offering a dedicated children’s play area so it’s perfect for busy mums who just want to get the family fed good food. Plus, they have a beautiful garden for you to venture into during the summer months. Enjoy their cosy interior, freshly prepared food and we’re sure your 20% South London Club discount won’t go amiss either. This is the Caribbean restaurant that is taking South London by storm. Since their humble beginnings as a takeaway in 1991, Cummin’ Up Catford has remained dedicated to serving authentic, flavoursome Caribbean dishes. Step inside their fun, funky interior and enjoy jerk chicken for mains with a “Die Hard Apple Crumble” to finish, washed down with a delicious mocktail. You can’t put a price on the vibe at Cummin’ Up Catford, but if it helps you’ve got 10% off your meal with your South London Club card. If you’ve been looking for somewhere in South London to get a towering burger that wouldn’t look out of place in New York City, then you’ve come to the right place. Big Fat Gourmet offers decadent burgers with fun, exciting twists including beef, chicken and veggie. Or you can grab a mixed grill platter and some hummus to share. Maybe you’ve got more of a sweet tooth, or it’s been a hard week and you deserve a treat. Well, Big Fat Gourmet offer Oreo, Ferrero Rocher and Kit Kat milkshakes, just to name a few! Plus, you can get your fill and get 10% off with your South London Club card, so no need to hold back when ordering! This Italian gem has been around since 1986, so they know a thing or two about pizza! Pop in here for a casual bite to eat at lunch and watch them hand-spin your dough and create an authentic Italian pizza right before your eyes. We’re huge fans of their pizza, but they also offer pasta, fish and meat dishes if that isn’t your thing. We think La Pizzeria Italiana is going to become your new favourite lunch spot, which is why we’re offering 10% off at lunchtime Monday-Friday with your South London Club card. Surely Catford can’t offer any more cuisines? Well, you’re wrong. Next on our world tour we’re stopping off in Japan. Sapporo Ichiban welcomes you with an eye-catching water feature and stylish interior, then blows you away with its superb Japanese cuisine. A fantastic sushi buffet is just one of the things that keeps customers coming back for more. 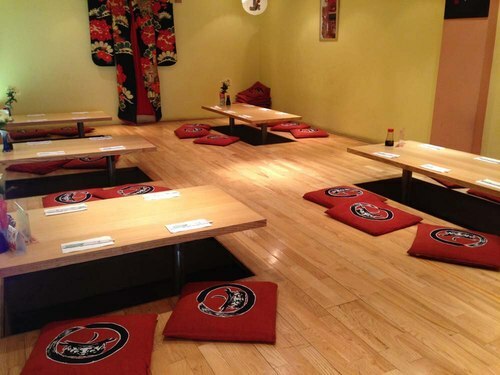 Be sure to check out their sunken seating area where groups can enjoy their food in a relaxed area. Plus, if you spend over £15 you can get 10% off with your South London Club card. And the tour doesn’t stop there! Saigon Foods offers fresh Vietnamese cuisine in a simplistic interior, bringing something truly special to Catford. They offer noodle and rice dishes, all flavoured with authentic South-East Asian spices. Their dishes aren’t only delicious, they’re super affordable. Even more so when you take advantage of your South London Club card discount, which offers you 5% off purchases over £15. Now we’ve proved that Catford offers almost every cuisine you could imagine, it’s time to go back to basics. Because sometimes you just want a sandwich and a coffee. Well, Raz’z Café is where you want to go. The hospitality is second to none and the café is decorated simplistically, with a decking area that has a nice view over Rushey Green. Everything you could want from a simple lunch, including 10% off with your South London Club card. Newer PostTooting: One Of The Best Neighbourhoods On The Planet?